This fireplace screen features a single panel with a linear, architectural design reminiscent of the mission southwestern style. 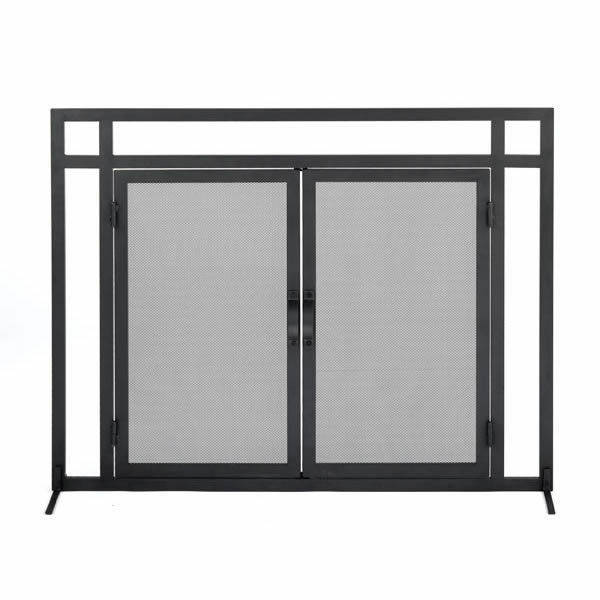 The simplicity of the design is emphasized by the black finish on the frame. You don't have to lift a hot screen when your fire needs tending. You simply need to open the fully functional doors to have access to the hearth and the logs. Wide based feet give the screen stability even when the doors are open. The dimensions of the screen are 39" W x 31" H - Door: 28-3/4" W x 25" H.
Are the feet on the front of this Woodfield Mission style black wrought iron fireplace hearth screen only or do they also appear on the rear of the screen? This screen does indeed have leveling feet that are present further inward on the screen, however they do not project toward the fireplace opening and will not effect screen placement. Do the feet of this screen extend behind or only to the front? Will we be able to have the screen flush against the opening or will it need to stand? This screen assembly only has stabilizing feet in the front of the screen. As such, it will be able to sit flat against the fireplace facing. That is correct. These are indeed screen doors. the design and material are great and really compliment our new fireplace and decor. It is well made and sturdy, and should last us many years. Ordering was easy and we received it promptly. Prosnice mission design. Sturdy and well made. ConsThe pictures on line show that the outside frame area is open and that only the doors are screened. We liked this idea because it would allow more of our beautiful new stone to show through. However, in actuality the entire thing is screened and kind of hides more of the stone than we like. Still better than anything else we looked at in this price range. This product possesses solid construction, but it falls short of a five star rating because a few of the welds are visible if you know where to look. Despite this minor quibble, I can say with confidence that I am overall quite satisfied with this product. Recently redid fireplace in stacked stone and travertine. Removed the old dated glass doors and replaced them with this screen. It fit perfectly and give the fireplace a beautiful updated look! This screen was not only the right size for my extra long fireplace, but also had a strong construction quality to it! It was just the thing to enhance the appearance of my fireplace.